These are ideal for couple who are staying in Orlando and want their privacy, but also wish to have a unique experience instead of just staying in a hotel. All of these places are actual Floridian homes, so it’s a great way to make friends with the locals as well. This high-rise room has downtown Florida at its doorstep, and is fully-furnished in a modern, chic way. The best part about this place is the everyday access to the rooftop pool and sky deck. It’s perfect for relaxing while towering over the vibrant, stunning view of downtown Florida. It’s also minutes away from Universal, Disney, and the major theme parks. What’s Florida without golf? Located in the center of a picturesque golf course, Bermuda Dunes is a gated neighborhood that boasts the best amenities in central Florida. With a fitness center / gym, luxury pool, hot tub, and tennis court, you may feel like you are dreaming! Coupled with the amenities of the neighborhood, the condo is located only minutes from Universal Studios, Disney World, SeaWorld, and International Drive, and is also a few blocks from bars, restaurants, and convenience stores. This stunning, wood-paneled home is truly something special. 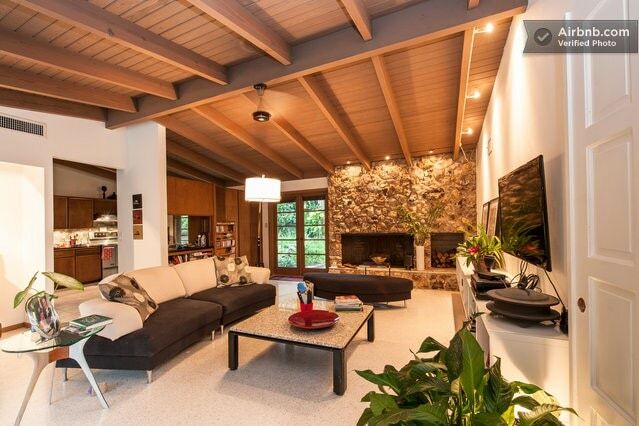 It has a private (heated) pool area and lots of garden surround the home, which still has the original 1960s charm of a mid-century modern home, complete with beamed ceilings, terrazzo floors, and lots of natural light. The hosts are incredibly nice, and they allow the guests to have full access to the patio / pool and grill, laundry facilities, and kitchen. They even provide snorkeling equipment for the pool, bicycles, and yoga mats. It’s a very accommodating place, and is, of course, conveniently located for all the places you might want to visit. This home is very beautifully furnished, and is perfect for couples or friends who want a cheap but luxurious stay. The special part of this place is that it showcases a very peaceful and serene view of the marina, and guests can just sit on the patio and enjoy the scenery. It’s also only 6 minutes from Universal Studios, and, at night, you can sit back and enjoy the Disney fireworks right from your room. This baby-blue themed room is just perfect in every way. It has a very calming effect on guests, and the walls have nice paintings on them. The neighborhood is very safe, centrally located, and it is surrounded by cool boutiques and cafes, with plenty of great places to hang out. Enjoy your stay at the heart of Orlando, with hassle-free parking, and exclusive access to a private lake. With restaurants and nightlife within walking distance, it’s the perfect place to feel at home while away on holiday. To give the stay a homier feel, you will be greeted with a complimentary hot breakfast every morning. This retro-style bedroom is perfect for both relaxing after a long day of enjoyment, but also great to keep you entertained. The Polynesian-style colorful walls and furniture make for a very quirky experience, and the room comes with a 43-inch (109-centimeter) HD TV, with free Netflix! It’s a great place to just chill and have everything you need. This room gives off a very cozy and private feel. Situated in a quiet neighborhood, it’s perfect for any couple who wants to head down to the beach and have a relaxing getaway in Florida. It comes with a spacious front yard, two porches, and a hammock for ultimate relaxation. But fastest fingers first, because this place is usually fully booked. This cozy room is everything you would need for the ultimate stay in Orlando, Florida. It is located ten minutes away from downtown Florida, so it escapes the hustle and bustle but is also very easily accessible. It is near to the Mall at Millennia, which has luxury retailers like Tiffany & Co., Cartier, Gucci, and more. Located on the 17th floor, this private bedroom overlooks the beautiful city of Orlando. Staying here will give you access to their infinity pool, a lounge and privacy. It is perfect for couples! These are ideal for families coming to Orlando to have the ultimate vacation experience. These apartments have more than one bedroom, and there’s a lot of leeway for more people, considering the whole apartment is for you and you only. Just be sure to check with your hosts first! This crazy, cool railway cottage is located right on the rail line! It has a cool, retro feel, and comes with the basics required for two people. This small cottage has access to a lush, tropical garden that is home to many critters. The place is a 15-minute drive away from the main attractions, which is a small price to pay for this really novel experience. Book this place today for a truly one of a kind experience while in Orlando. This bright, beautiful and luxurious townhouse is perfect for families coming to Florida for all the theme parks. This townhouse is located mere minutes away from Universal Studios and all other main Orlando attractions. It also comes with amenities like a washer, a dryer, a 55-inch (140-centimeter) flat-screen TV, free parking, free Wi-Fi, and air-conditioning. It’s big enough to fit 10 people, so this one is great for big groups! The master bedroom has a king-size bed and the other bedrooms have a queen and full bed. The house has a big screen TV, a fully-stocked kitchen, an espresso machine, Wi-Fi, new mattresses, a washer and dryer, and 2 car garages. The Jasper is located smack bang in the center of Orlando, and it gives its guest easy access to the best local eateries, world-class shopping, and it’s literally a hop away from the interstate for guests to visit all the theme parks that Orlando has to offer. The apartment is very tastefully furnished, and, if you need something, there’s a 24-hour concierge at your service. This is a newly-remodeled American home, with 4 bedrooms and 3 bathrooms. It’s perfect for families who plan to stay in Florida for slightly longer than an average vacation period. It comes with a fully-equipped kitchen, and an open area dining room. Or if you prefer to dine al fresco, the backyard is available. It’s absurdly convenient, with Starbucks, Pizza Hut, Chipotle, and other eateries right next to it. They also provide free parking. This bungalow feels like you’re in your own private resort. It’s tucked away behind a primary home, and the surroundings really make you feel like you’re truly in the Sunshine State. The décor is very tasteful and quaint. It’s also conveniently located, around downtown and all the parks. Located on Lake Jessamine by downtown Orlando, this beautiful 3-bedroom house was built in 2006 as a 2nd-story add-on. It is separate from the house downstairs and equipped with a kitchen, a deck, and a laundry room. Seize this opportunity and have fun with all the lakefront activities! This delightful ground-floor corner unit feels like a resort, but at a much cheaper price. It overlooks the lake, but also has its own private pool. The house is very close to all the main attractions, including International Drive, the Convention Center, Universal Studios, Disney parks, and the Mall at Millennia. If that’s not enough, the neighborhood is scattered with bars and restaurants for more variety of choice. This apartment is located at an upscale and quiet neighborhood, and is close to downtown Orlando, the Winter Park, and about a 30-minute drive from the theme parks. The place has access to a community pool, a gym, and a playground, and, of course, you can enjoy gorgeous views. It is a perfect place for small families coming to Orlando on vacation. This gorgeous cottage is located ON a lake itself, and allows for an escape from all the noise and crowds in other parts of Orlando. 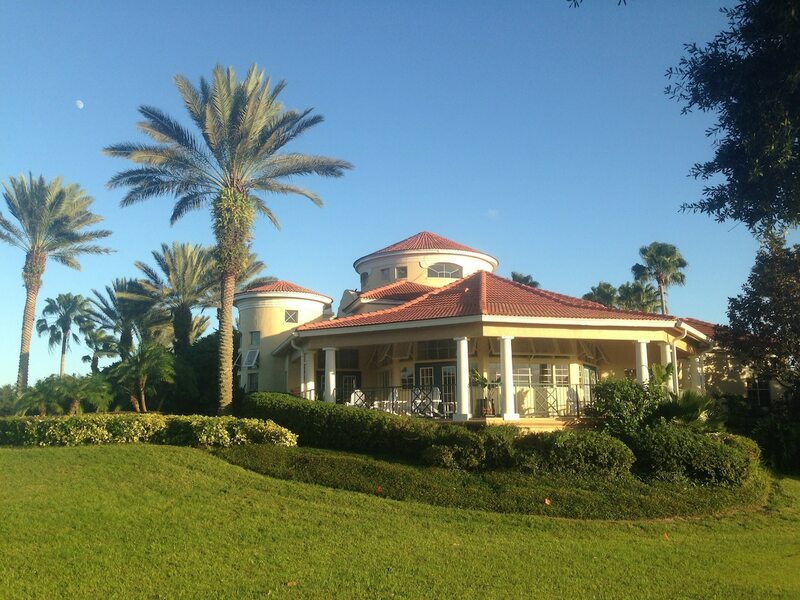 While secluded, it is actually very easily accessible, and is only 22 minutes from Disney. The doors in the house are all glass, which shows the stunning views of the lake. It also comes with a full kitchen, a quaint living area, and a full bathroom that’s connected to the bedroom. It is perfect for a romantic getaway. “Awesome house. Very comfortable with all the necessary amenities. The landscape is gorgeous and the location is great.” - Raymond/ Guest review. This tiny house on the lake is charming. The large outdoor seating area is popular as it’s a perfect place to relax. There are some basic cooking facilities, like a hot plate. Best of all, it’s pet-friendly, but guests are expected to clean up after their animals toilet. Access the kayak or paddleboard. Use the fishing poles and visit the fishing jetty. There is WiFi access, a laptop-friendly workspace, and free parking. The cute little house can sleep up to three guests. It’s a quiet area but close to theme parks and downtown Orlando. Stay in this unique accommodation. The luxury vessel won’t leave the harbor, but you are right on the water, literally, at Lake Monroe Marina on Lake Monroe. Guests enjoy watching the marina traffic and sea life and they can walk to the beach or places like Historic Sanford. The vessel is as equipped as any top condo. Bars, restaurants, art galleries, and other entertainment are close by. Two beach-cruiser bikes are available to help you explore. The boat sleeps up to four guests. With these convenient locations and the great prices they offer, you can have fun on your holiday without having to break the bank. And that’s sure to put a smile on anyone’s face! Book yor Orlando accommodation and enjoy the best of the USA’s Sunshine State.